Wash, core and cut tomatoes into eighth-sized wedges or wash your grape tomatoes. Blanch cleaned and trimmed asparagus and green beans in heavily salted rapidly boiling water for about 15 seconds and cool in an ice bath. Drain and set aside. Drain fresh mozzarella and tear apart into small chunks. Combine cheese, beans, asparagus and basil in a mixing bowl and toss with olive oil, salt and pepper and serve. Abhishek did not provide a story with this recipe but I love the idea of adding asparagus and spring beans to a traditional caprese salad. 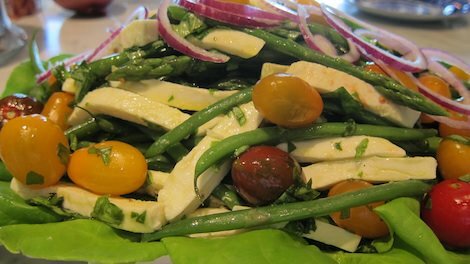 We had it as a luncheon salad and it was devoured with gusto - the string beans and asparagus combined with the tomatoes, basil and of course mozzarella are a wonderful, healthy combination. It's a keeper! Thank you Abhishek. You can omit the asparagus and the salad is still excellent with just the green beans. Add thinly sliced red onion rings and serve the salad over Butter lettuce.